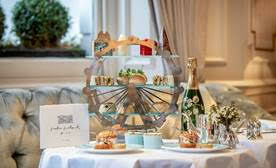 Town House at The Kensington in London just launched a new London Landmarks Afternoon Tea. Following the success of the Tale As Old As Time offering, the new afternoon tea takes inspiration from London’s most recognizable landmarks, taking diners on a tour of the capital’s most famed structures. Tributes featured on the menu include ‘The Gherkin’ crafted from white chocolate with a dark chocolate ganache and ‘The Shard’ made of carrot cake and milk chocolate. Alongside a ‘London Telephone Box’ imagined in rhubarb mousse and Big Ben-inspired lemon curd tart, the new London Landmarks Afternoon Tea menu is complete with London’s quintessential treat: scones served with Heather Hills strawberry jam and clotted cream. London Landmarks will be presented on a London Eye-inspired tea stand. 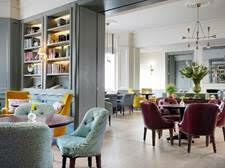 The afternoon tea will be served alongside a bespoke map of London illustrated by Eleni Sofroniou. Guests can keep the map, which highlights landmarks including Kensington Palace and The Tower of London as well as archetypal spots such as Covent Garden and Big Ben. The new menu at Town House is a celebration of London, welcoming guests to enjoy a selection of appetizers: a cockney stapleSteak & London Ale Pieand aColston Bassett Stilton & Broccoli Quichealongsidea bite-sizeCrab Cake with Tartare Sauce & Caperberries. Highlights of the sandwich selection includeSmoked Salmon, Lovage Pesto & Cream Cheese on Brown Bread, Egg and Cress Bridge Roll using eggs from Heritage breed Copper Marans hens,Coronation Chicken Sandwich on Brown Loaf. Town House is the signature restaurant at The Kensington hotel andis spread across three classically designed drawing rooms, serving locally-sourced, seasonal modern British cuisine. Nestled in the heart of one of London’s most desirable neighborhoods –complete with stylish décor, hand-picked furnishings and open fireplaces – Town House also provides intimate porticos overlooking South Kensington’s tree-lined avenues.